I loved this melted crayon stained glass window idea from Kaboose... but didn't want to cut out leaves, so I decided to change it up a little bit and do a similar window using an acorn. Materials Needed: colored cardstock for the frame, white crayon, scissors, wax paper, old crayons, cheese grater (old one), iron, ironing board, 2-3 old cloths/towels, tissue paper, stickers, Fall leaves, hole puncher, ribbon, and tape. - Make a frame for your project by drawing an object (we chose an acorn and used an acorn tracer) onto colored cardstock using a white crayon. - Cut out the inside of the picture. I do this by poking a hole in the middle of the picture with a pair of scissors and then I cut outward and around the picture's interior... leaving a frame. I had about 8-10 kids doing this in my craft class today, so I prepped all of these ahead of time. Definitely saved a headache during the class! 1. Have your child use a cheese grater over a bowl to shave several different colored crayons. We used the large and small sized grater sides (the smaller sides were easier for little hands). 2. Rip up some tissue paper into tiny pieces. 3. Place the Fall leaves, crayon shavings, and tissue paper pieces onto one side of the wax paper. Add stickers and any other items you want to include (grass, petals, whatever). 4. Heat up your iron and place a towel on top of your ironing board. Next, close the wax paper, put it on top of the towel on the ironing board, and then place an old thin sheet or towel on top of the wax paper. 5. With parent supervision, we let each child have a turn helping move the iron across the towel/sheet (on top of the wax paper). 6. Take the towel off and admire the melted crayon masterpiece. 7. Trim the wax paper to fit the back of the acorn frame. Tape the wax paper to the back of the acorn frame. 8. 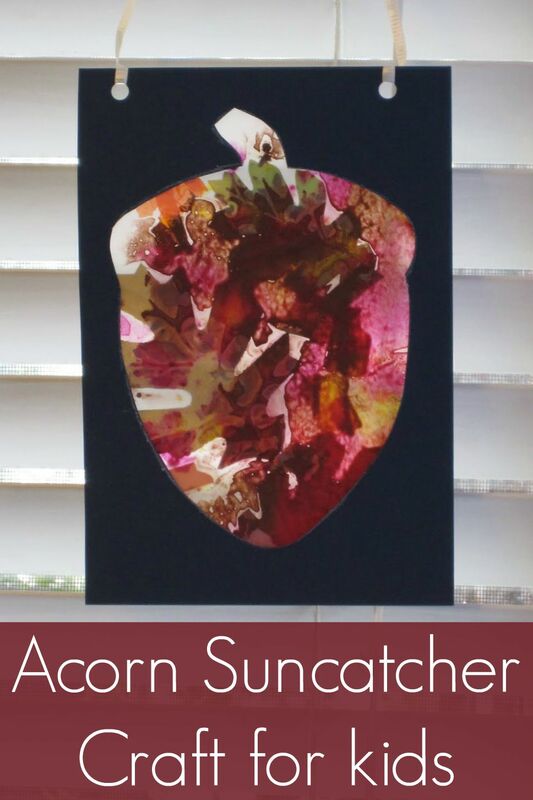 Turn the acorn picture around and hold it up to the light or a window and admire all the beautiful colors! 9. Lastly, we punched holes in the frame and added ribbon to help hang the stained glass window. In the craziness of our class we didn't have time to do any other activities related to acorns, but I loved talking with each kid after they were done and having them show me all the colors on their acorn. The older three and four-year olds were excited to show me their finished projects and tell me about the colors and leaves they used. these are great! the finished product looks fabulous. I will have to give this a try! Sharing on FB my friend & hope to see you stop by this week's Sunday Showcase to link up some of this fall fun you've been up to!! !